With the beginning of the school year, schedules become jam-packed and action-filled but the best thing is that it is finally time for football. As much as I have learned to enjoy the game, it’s the overall experience that really revs my engines. As a certified “Band Geek,” for years I felt like the only reason for a football game was to provide an opening and closing act for halftime. Then I realized what I had been missing for so long. NOW . . . I love it all: Pickup trucks with antenna flags. Drum cadences and marching music. Shimmery pompoms and pretty girls jumping up and down. Waving at old friends in the stands. Inflatable helmets. Cool breezes, although we don’t usually feel them in this part of the country until several weeks into the season. The sound of football pads and helmets crashing into each other. Hummingbird-sized moths and crickets dive-bombing the fans. Teenage boys who have just discovered face paint. Band kids who have written their own cheers for different instrument sections. “Too BAH . . . Tooo BAH!” . . . Scrumptious sunsets. The smell of sweaty kids intermingled with freshly popped corn. And one of the best feelings of all . . . TOUCHDOWN! MUSTANGS SCORE! One of my favorite images from 2009. I sure hope to capture more of these this season. 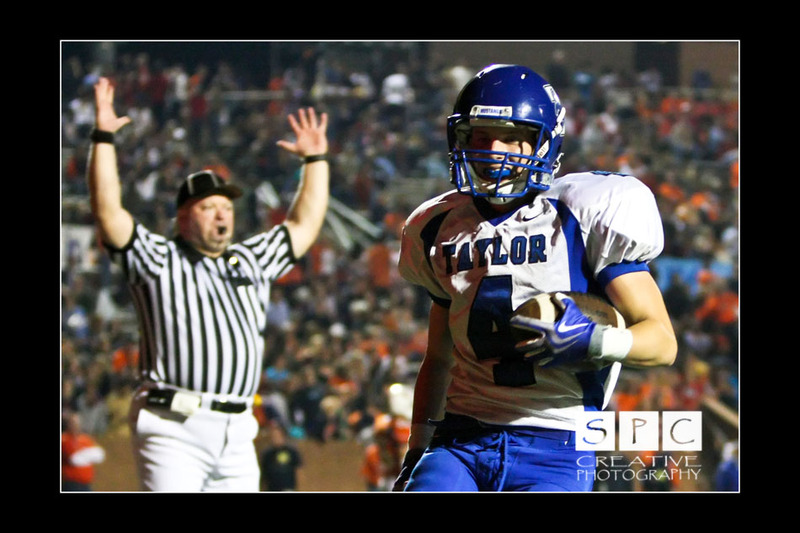 One of my favorite parts of football, naturally, is photographing the games. I feel incredibly privileged to be allowed on the sidelines at our local high school games, and I truly believe that each of the kids on the field should have access to quality photos of themselves in their shining moments. This means that in addition to the athletes, I need to capture images of the student trainers, the band, the cheerleaders and mascots, the drill team, the fans in the stands. Hopefully they will be sharing these images with their own kids 15 to 30 years from now. Not too long ago, the Athletic Booster club at our high school asked me to help with the program that they sell each week at the football games. Now, these programs are not your standard stadium leaflets with just the names, numbers and positions of each player. Our boosters sell ads — LOTS of ads — to local businesses and to parents who buy half and full page spaces honoring their kids. The printed programs are spiral bound and bigger than most high-fashion magazines that you find on he newsstands today. Maybe I’m a little bit crazy for what I did, but since the team had to print a new cover each week any way, I suggested that they change it up a bit with new action photos on the front rather than the same basic design week after week. They LOVED the idea and while I bit off a pretty hefty project, it pushed me to develop my graphic art layout skills. Remember . . . I am a PHOTOGRAPHER, and not a graphic artist. Still, I know what works. We started creating a new cover for every game and also stepped up the print quality. In the center of every program a couple of other very talented photographers and I provide bold and shiny color-plate pages with action photos from the previous week’s game. 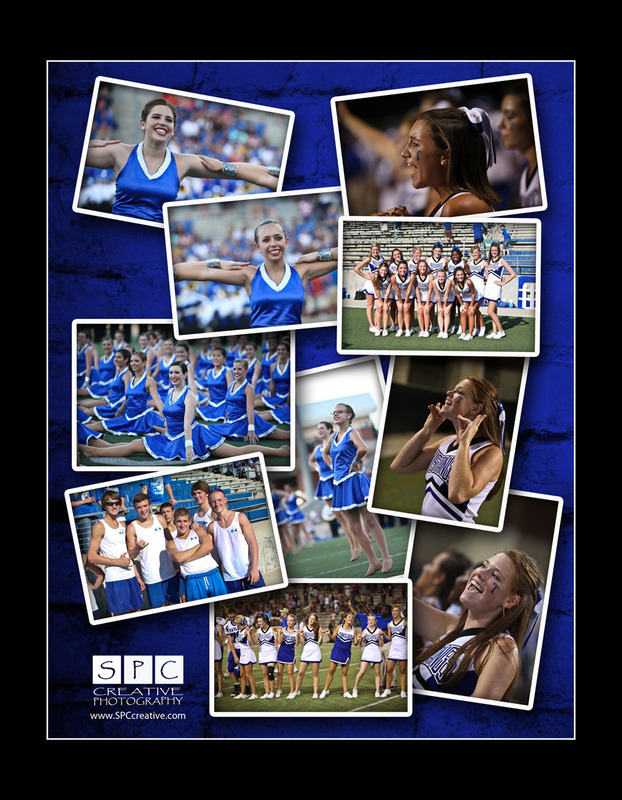 I usually provide two pages of football action and two more pages featuring the band, cheerleaders, drill team and fans. Quite a few parents have told me how much they love these programs, and because they never know if their students will appear inside, they have a little added incentive to purchase a new book at each game. This raises a nice tidy sum of money for the Athletic Booster Club. 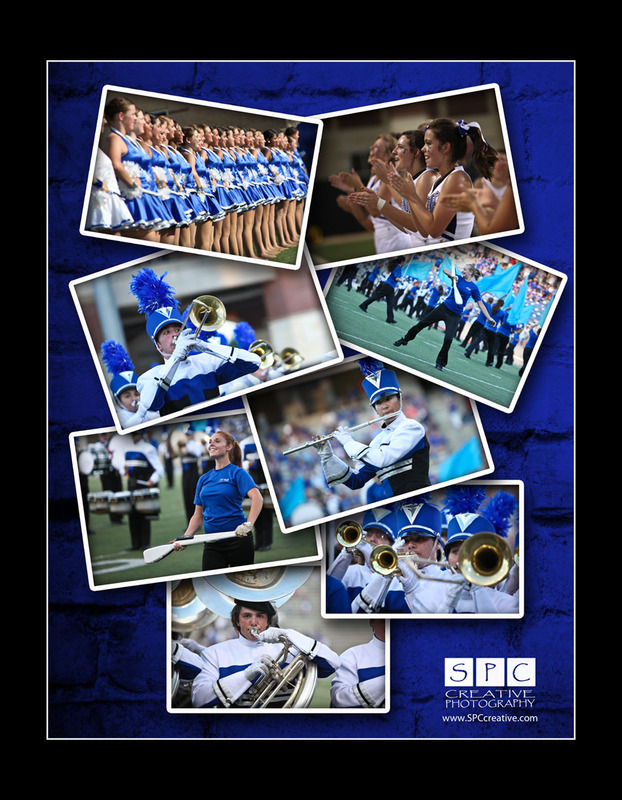 Once a year we dedicate a program cover to the band as well, acknowledging the grit and determination of approximately 300 more students who take to the field as if going to battle. I was in MY high school band (Go Midland Lee Rebels) and my sons were all in band too. I KNOW how hard these kids work. Thankfully our football coach and the board of our athletic boosters know how hard they work as well. They have been totally supportive of the band issue, which I think is REALLY cool. In 2008, the first year I was involved, our program chair entered one of our books into a competition for the National High School Sports Publication Awards and we won the Gold Medal for schools over a particular size with parent involvement. We chose not to enter in 2009, opting instead to let another school somewhere else enjoy the prestige and excitement that we enjoyed so much. I’m proud to have contributed to that award but the real thrill I get every week is looking up into the stands and seeing parents and students studying the new programs, looking for photos, and showing them off to each other throughout the evening. 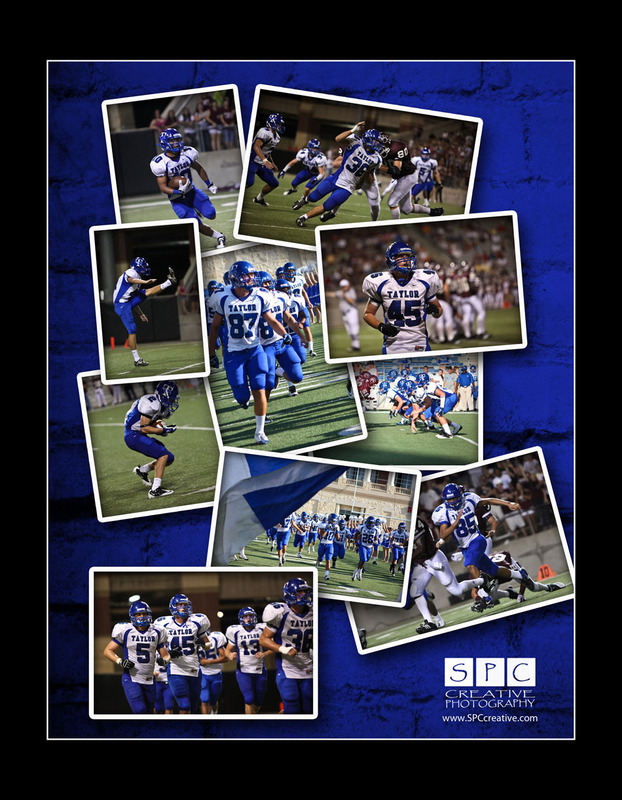 Here’s the program cover for our pre-district season opener this year . . . followed by the inside “action” pages. Imagine my surprise this year when a couple of photographers from other parts of the country contacted me, asking for tips on creating collages and layouts for their own local schools. WOW! I still feel like a bit of a newcomer in this area,. Still, because I spent so many hours in the School of Hard Knocks working on these projects, I believe I have an obligation to help others with their work . . . to the extent of my capabilities. 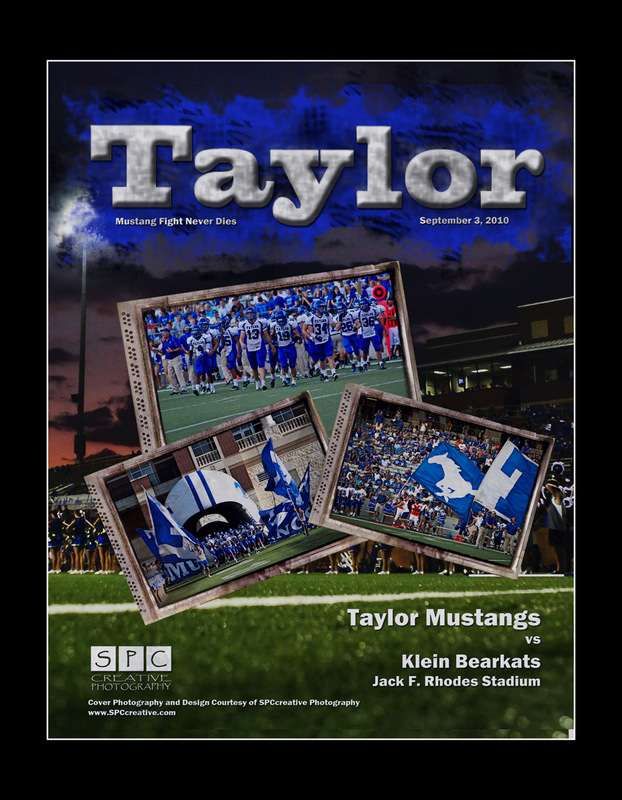 The color pages on the inside are always a little different each week, but here are the ones that we included in the first program of the season in 2010. 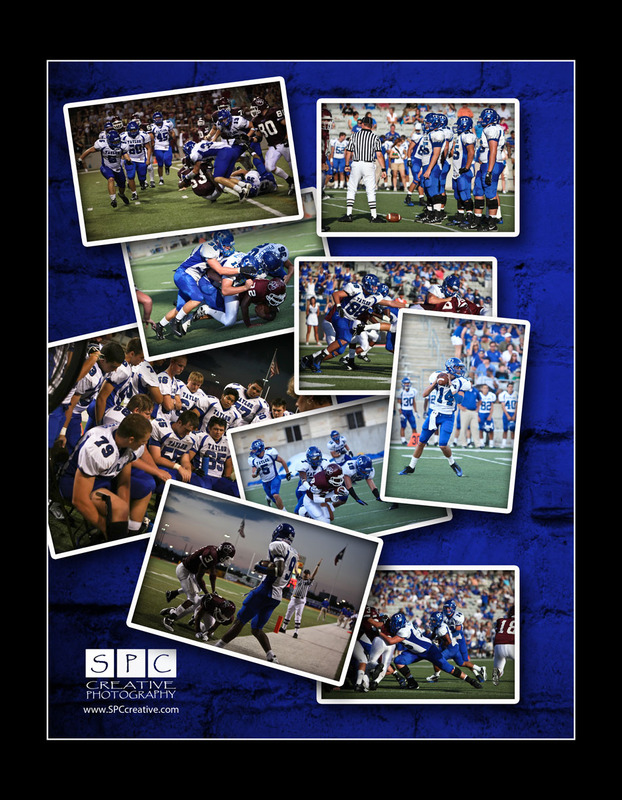 Each week as new programs come out, our new covers and action pages will appear in the Sports section of my web site. It’s kind of fun to look back at programs from the last couple of years and wonder what path we’ll take in the days ahead. Okay . . . I’m having issues making my links work on the blog page, but if you’ll go to THIS LINK: Cut and paste it if you have to . . .
You should be able to see all published covers and action pages from the last two years as well as new pages as they are released. Happy Football Season Everyone. Enjoy FALL!